Voyager Therapeutics, Inc. VYGR – We alerted on VYGR on the 6th of September, witnessing a low of 12.33 and after finishing the rest of the month on a bullish streak, Friday brought a new high of 22.28. That’s a three week swing of 81%, which is fantastic for a stock in this price range. Capricor Therapeutics, Inc. CAPR – We signaled our interest in CAPR later on in September,on the 20th. The following day we observed a low of 1.80, and like the above-mentioned play, it never looked back. Friday’s new high of 3.05, represented a 69% increase in just over a week’s time. 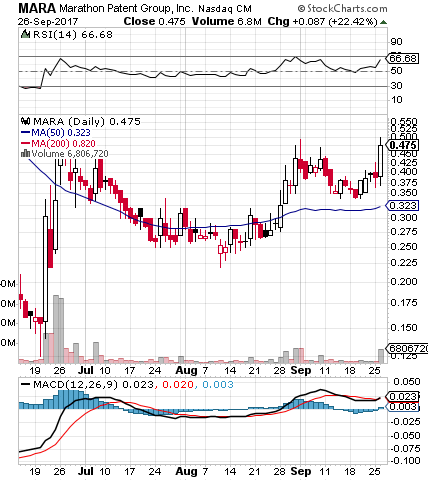 Helios and Matheson Analytics Inc. HMNY – We’ve discussed this one quite a bit recently, also beginning on September 20th. That morning we saw a low of 5.469, and once again, it has been nothing but bullish moves ever since. On Friday the stock hit 14.17, marking a fantastic move of 159% in a little over a week. We also wanted to provide the final figures on the BBRY options we signaled in Thursday’s premarket report, the BBRY Weekly $9.50 & $10 Calls. Friday’s session brought new highs for both sets. The final intraweek range on the $9.50 Calls ended up being from .37 to 1.81 for a gain of 389%, while the $10′s breached the ten-bagger mark with an extraordinary run of 1025% from .12-1.35. Even readers who just caught Friday morning’s mention of these plays could still have made single-session profits of up to 103% and 202%, respectively.